The story of Van Gogh – a lesson to us all! So many times in the recent past have i heard experts in the art field tell me that it doesn’t matter how good and accomplished an artist you are, if no one gets to see your work, or to hear about you, then you will never be seen as a success or make any money.How true is this when we look at the experiences of dear old Van Gogh, who to my mind was one of the most talented artists that has ever lived. 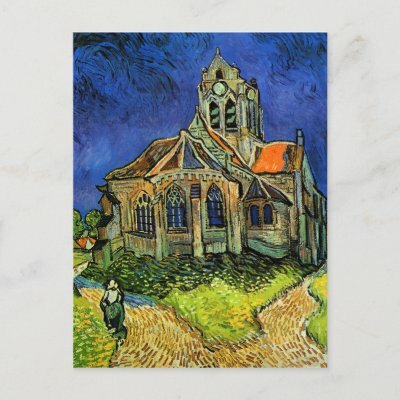 Van Gogh seemed to have a constant battle going on whilst he was growing up, as he was torn between following the religious path of his father, or following his true vocation. When i read about this i truly empathized with him, and knew what it was like to spend your life trying to please those around you whilst not being true to your self.The difference for me is that i now have the chance to follow my dream in a less traumatic way compared to Van Gogh. I do believe that there is a path that is set down for us before we arrive on this earth, many of us wander off it many times, and some of us are lucky enough to finally ‘get back on track’, Van Gogh’s path was so obviously that of being an artist, and so he found that whatever he tried to do other than that was inevitably a failure. He tried to be a missionary,a lay preacher , a translator of the bible,an assistant language master, but in none of these areas was he successful. I also admire his tenacity as Van Gogh was not born an accomplished artist, but he was determined to become one, and drew and drew and drew until he became better and better, studying books on anatomy in order to refine his skills. Financially his life was a disaster, he was fortunately supported by his brother Theo, and would send him a painting a month in exchange for money to pay for his board and lodgings and art materials. His love life was also a disaster, he was rebuffed by his landlords daughter whilst lodging in London and went into a deep state of despair, this was when he tried to find solace in religion and set about translating the bible.The teaching work he obtained after this was unpaid and i wonder if he ever felt that adding this to the fact that he had so desperately wanted to be accepted and recognised by his father, if he had ever felt valued and accepted in his life?He later fell in love with his widowed cousin, but his intentions were once again unwelcome. He finally had a relationship with Clasina Hornick (otherwise known as Sian) who had a child and was also pregnant with another, she had worked as a Prostitute previously, but gave that up whilst living with Van Gogh as he was funded by his brother, but as the money ran out she went back to prostitution, and Van Gogh left. 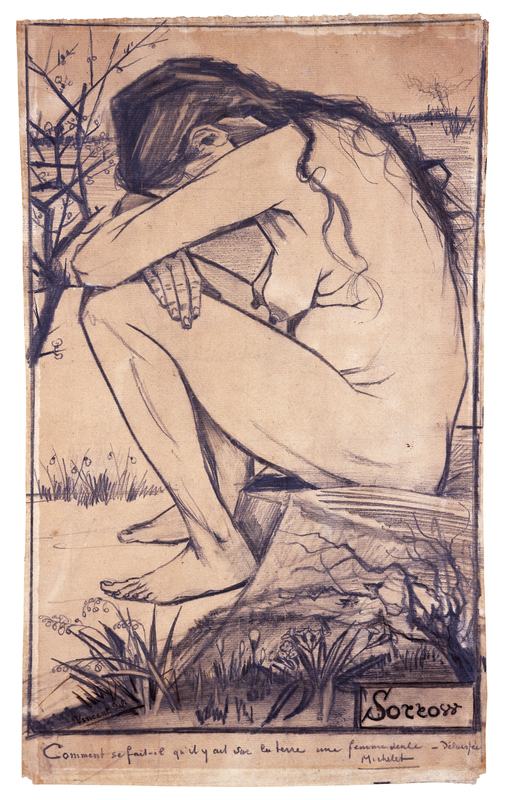 Van Gogh painted a black and white picture of her and named it sorrow, and i think this starts to give a real insight into what he was going through at the time. In 1886 his father died and Van Gogh started to suffer with ill-health and depression he had moved to Paris by this time, and was now mixing with artist such as Toulouse-Lautrec and Emile Bernard.He was fascinated with he impressionist movement that was going on and studied the techniques used by artists such as Seurat, and also made friends with an artist called Gauguin who he teamed up with.However the relationship didn’t last long and broke down because of Van Gogh’s emotional and mental state at the time.I find it interesting though to see the influence Gauguin had on Van Gogh, his use of bold colour rubbed off on Van Gogh greatly, and Van Gogh incorporated much more colour into his paintings from now on.He became fascinated with the effect of using complementary colours, placing them next to each other, and then assessing their effects, he also studied Delacroix and looked at his use of colour as well. I think this is why Van Gogh appeals to me so much, and also more recent artists such as David Hockney, as i am drawn to the bold use of colour, and also the fact that they seem to break all the rules! It was after a quarrel with Gauguin that Van Gogh severed his left ear, and i think that it is also a sign of his severely disturbed mental state when he also take it to a prostitute to keep hold of for safe keeping.Van Gogh’s style was now changing all the time, his strokes bolder, his colours more vibrant – it makes you wonder if insanity and pure genius are interwoven, as in my mind the more disturbed he became the more gifted he became as well. He spent the rest fo his life in and out of mental hospitals, but all the time being allowed to continue to paint.Painting i feel was his only release.I wonder if it would have made a difference if his talents had been recognised whilst he was alive? Would that recognition have eased his mania i wonder? He knew he needed help, and i think he also knew that he wasnt made to be a part of society, but merely an observer and recorder of it, he did on his last stay at a mental hospital voluntarily admit himself.One of his final paintings was of the church of Auvers Sur Oise, which makes you wonder if he was making a journey back to religion, he does paint this church without a door or any sort of entrance which again would make you wonder if he still considered himself to be an outsider? Eventually, and very methodically Van Gogh took himself out of the building armed with a gun and shot himself in the chest, his brother who had supported him for most of his adult life raced to be by his side and was there at the moment of his death. The final tragedy coming as Theo himself died only six months later of syphilis , and they both now lay side by side in the cemetery. Van Gogh died at the young age of 37, in those years he reportedly produced hundreds of paintings, and yet at the point of his death he hadn’t sold one. They now of course sell for millions, and where is the justice in that? Damian Hurst was interviewed recently and questioned about the amount of money he sells his works for. He commented that someone had said to him at one point that Van Gogh had died without selling one painting, and should he be selling his for millions? I find this question totally absurd, to think that we need to be dead to gain recognition, and that there is anything wrong with being a success whilst being alive is ridiculous. At the end of the day no one is forced to buy anything they don’t want to, i do often wonder though who receives the money from the Van Gogh paintings that are sold, and what did his brother done with the one painting a month he sent him for years? I guess we will never know. But in conclusion as far as Van Goghs story is concerned, maybe his purpose was to be an inspiration to other artists coming after him , and if that is the case then his life wasnt in vain as he has totally inspired me, and he has left a legacy of beautiful paintings behind for us all to enjoy!